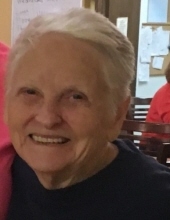 Fair Play – Hazel Freeman Sheriff, 77, widow of Lamar “Pete” Sheriff, passed away, March 31, 2019, surrounded by her loving family. Born in Oconee County, SC, she was the daughter of the late Edgar Freeman and Maybell Moore Freeman. Hazel was retired from the Oconee County School District where she worked in the cafeteria at Fair Oak Elementary School and was a member of South Union Baptist Church. Survivors include daughters, Lisa Barker (Kenny) of Westminster and Kris Gauthier (Joseph) of Seneca; four grandchildren and two great-grandchildren. In addition to her husband and parents, she is preceded in death by a daughter, Libby Jones; brothers, John Freeman and Ronnie Freeman; and a sister, Maryann Shook. A graveside service will be held at 2 pm, Wednesday, April 3, 2019 at South Union Baptist Church Cemetery. The family will receive friends 6-8 pm, Tuesday, April 2, 2019 at Sandifer Funeral Home. To send flowers or a remembrance gift to the family of Hazel Freeman Sheriff, please visit our Tribute Store. "Email Address" would like to share the life celebration of Hazel Freeman Sheriff. Click on the "link" to go to share a favorite memory or leave a condolence message for the family.